Estancia is one of the top communities in North Scottsdale. 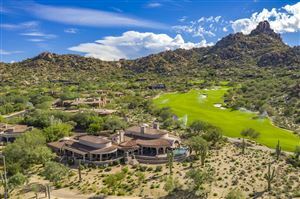 This elegant private guard gated golf community, on 640 acres, wrap around the north side of Pinnacle Peak, Scottsdale, Arizona’s famous natural landmark. Estancia consists of 223 custom homesites and 39 Tuscan-style villas known as The Homes of LaScala. Custom homesites range in size from one-half to two acres. Design guidelines ensure that each custom home will blend and contour to the site. Custom homes West of the Homes of LaScala and the clubhouse are considered the West Side of Estancia. The West Side of Estancia is the sunny side and offers custom homes city light views and wonderful sunsets.